How exactly does the whole editing process work? Do you just write a script, and email it to someone or something? Well Kate, I actually had some success this past day trying to find a solution to the reply problem. There are two issues I’ve noticed, one that is WordPress’s “fault,” and the other that is likely due to page-size issues (trying to cram too much data in the form of comments on just one page, basically). The first one I speak of is how when an individual replies to another person, their comment (if it works) appears directly under the one they replied to and is slightly indented to show that it’s a reply. WordPress refers to this as nested/threaded comments, and you can access it in the WordPress dashboard via Settings -> Discussion and modify the depth of these comment chains. Unfortunately, the max I’m allowed to make it with the setup I’m using is 10 replies, and then I have no ability to continue to reply to the most nested/indented comment, only the previous less nested ones. I’m uncertain if there’s a way to bypass this currently (I’m trying to avoid altering WordPress’s core files since that could lead to instability) via a plugin, but I’m certain any solution to this would require an overhaul of the comment formatting to a system like YouTube’s video comments or something, which is aesthetically different than what BlogClan has now. The second issue is what I’ve been looking at in particular, and it deals primarily with comments appearing on an entirely different page than they are meant to. From my experimenting, I figured out that WordPress does have a setting that limits the number of comments you can make on a post before it creates a new page, and it is also accessed through Settings -> Discussion. However, this only applied to new comments that weren’t replies (like this comment I’ve written. It is not a reply to anyone, it is a new comment). Replies, on the other hand, should just become nested under the parent comment they were made at and ignore this rule entirely. However, when there are a large amount of comments on a single page, it overwhelms it and causes the website to spillover onto a new page (or act abnormally) to prevent that. This is just a conjecture, but it provides a somewhat adequate explanation for these occurrences on the site. Currently, I am running a virtual server through my PC using Microsoft’s WebMatrix, which allows me to emulate an actual website. It’s limited on who can use it (local only), but it allows me to create accounts and carry on conversations with myself because I’m insane in the WordPress environment and alter the PHP files that oversee comment submissions/forms. I don’t know what web hosting service you use (other than it’s not a default WordPress because of the unique domain) and whether or not this might make my tinkering in the vanilla version of WordPress useless, but I have managed to get a rudimentary system created that appends a “Response to [Parent Post’s Author’s Name]” at the very start of a response that can be clicked to either a) scroll to the parent post if it’s on the same page, or b) open a new window with the parent post in focus if the reply and parent post are not on the same page. ‘ (SLASH) with myself because I’m insane (END SLASH) in the WordPress environment and alter the PHP files that oversee comment submissions/forms. I don’t know what web hosting service you use (other than it’s not a default WordPress because of the unique domain) and whether or not this might make my tinkering in the vanilla version of WordPress useless, but I have managed to get a rudimentary system created that appends a “Response to [Parent Post’s Author’s Name]” at the very start of a response that can be clicked to either a) scroll to the parent post if it’s on the same page, or b) open a new window with the parent post in focus if the reply and parent post are not on the same page. Holy cow, Whorlpelt, that’s awesome. I don’t really use PHP that much since I don’t have much use for it- the most html I’ve done is some buttons and design edits for my blog, but luckily that’s not WordPress- I find blogger a bit more user friendly. OK, first, you just blew my mind. I am SO blessed by BlogClan’s brilliance. Whorpelt I have no idea what you just said but It sounded cool. Yay for confusion! AND FINALLY, WHAT IS YOUR FAVORITE SODA? My favourite sort of questions! I don’t drink soda. It’s bubbly and cold and full of sugar/additives. It is the devil’s invention. I drink herbal tea, water or sometimes elderflower cordial. I have absolutely never thought about it. The characters and their names are so intertwined in my head. 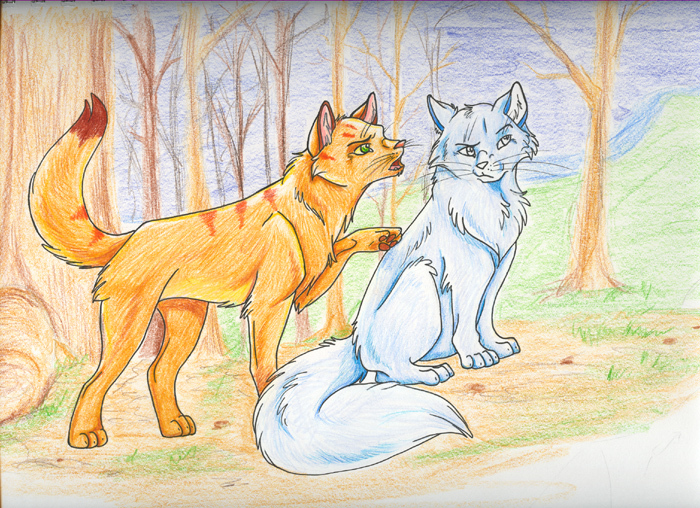 Just off the top of my head, Firestar would be Colin and Graystripe would be Joel. See? That’s spoiled them for me already? This may seem random, but will Stormcloud or Bumblestripe ever get mates? My guess is Stormcloud will either get with Rosepetal or Cherryfall. As for Bumblestripe, who knows?